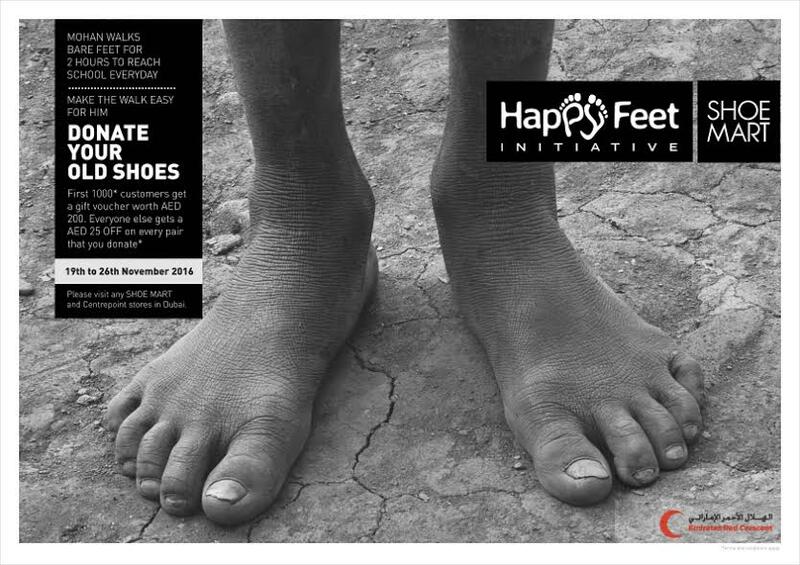 Dubai, UAE: Reinforcing their commitment towards bringing about a positive change where they can; Shoe Mart, region’s leading shoe brand for the entire family, announced their ‘Happy Feet’ initiative. Highlighting the fact that there are a number of people around the world who aren’t fortunate enough to have the means to protect their feet; Shoe Mart has partnered with the Red Crescent society to provide the needy with shoes you may not need. To support the cause head to the nearest Shoe Mart store with your old pairs of shoes from November 19th to November 26th and get rewarded for your donation. First 1000 customers will receive a Free pair of Shoe worth AED 200. All other customers who donate will get AED 25/- Gift Voucher which can be redeemed on shopping of every AED 100 at Shoe Mart & CentrePoint stores in Dubai. The Donation Drive will be conducted across all Shoe Mart stores in Dubai including Centrepoint stores, except Outlet Mall. Remember, your old shoes could mean new-found happiness to those less-fortunate. Help us to help those in need. SHOE MART is the region’s most established and largest retail concept for footwear and accessories, offering a galore of brands and value-for-money goods for a diverse audience under one roof. Founded in March 1990 in Dubai, SHOE MART has grown from a single shoe store to one of the largest ‘footwear and accessories’ retail chains in the GCC region comprising of 165 stores spread across UAE, Saudi Arabia, Kuwait, Bahrain, Qatar, Jordan, Oman, Lebanon and Egypt and over 13 countries worldwide. SHOE MART offers extensive range of in-house brands like Duchini, Paprika, Peppermint, Missy, Juniors, Barefeet, Little Missy to leading international brands like Ecco, Lee Cooper, Puma, Reebok, Kangaroos and Skechers, along with accessories such as belts, handbags, luggage bags, purses, school bags, and an array of shoe care products, socks and wallets.